It's only fitting that New York City's oldest and most densely populated borough has been carved into stone. 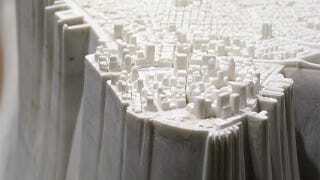 Titled Little Manhattan, the stone sculpture is the handiwork of Japanese artist and architect Yutaka Sone. Sone created this work using Google Earth, city photographs and overhead helicopter flights. The details included are amazing. There are big buildings, small buildings and even Central Park. Despite its urban subject, the sculpture is highly artistic. The choice of white marble gives the buildings a crystalline, ice-like appearance and the large base elevates the city,making it the focal point of the display. Little Manhattan will be on display at New York's David Zwirner Gallery starting September 20th.